Water Rails were proven to breed in eight tetrads, more than ever before in the county. In all of these cases, observers saw adults with chicks: they have been reported from early May to August, presumably indicating two broods. All of the definite or probable breeding tetrads were towards the north of the county, and the sites at which breeding was confirmed read like a roll call of the county’s main wetlands: Woolston Eyes, Risley Moss, Rostherne Mere, Fiddler’s Ferry (the first breeding there) and Neumann’s Flash. 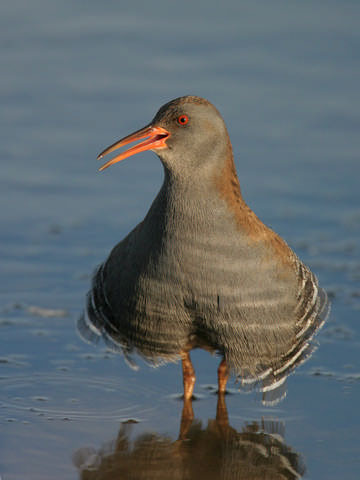 Water Rails have colonised the north Wirral since our First Atlas, with alarm calls heard in 2004 and 2005 from birds in Red Rocks Marsh (SJ28E) where they were first proven to breed in 2001. The species has not been recorded in the east of Cheshire since they favour the eutrophic lowland waters. They mainly eat aquatic invertebrates but will also take vegetable matter and occasionally fish and amphibians. Water Rails were reported in 31 tetrads during the three years, with breeding confirmed in eight and probable, through recording of pairs, display or alarm calls, in a further four. Nineteen tetrads were logged with possible breeding through observers seeing individuals or hearing breeding calls. Eight of the tetrads had also had breeding season records during our First Atlas, with ‘gains’ in 23 tetrads and ‘losses’ from 18. Work elsewhere has shown that thorough surveying of areas of suitable habitat, including playback of the birds’ calls (Jenkins & Ormerod 2002), usually reveals many more birds than were previously suspected. At least nine pairs and two single birds were found in 2002 in an RSPB census of phragmites/ scirpus/ juncus/ typha reedbeds at Neston, Burton Point and Inner Marsh Farm (Wells 2002). The breeding population of Cheshire and Wirral is likely to be at least twenty pairs. The national total is unknown, but Brown and Grice (2005) suggest a figure for England probably in excess of 1,000 pairs. Water Rail has now (2007) been added to the list of species monitored by the UK Rare Breeding Birds Panel because of its perceived scarcity. There has been some concern over the species’ status and conservation, causing it to be placed on the Amber List, not least because their breeding range contracted significantly between the two national atlases (1968-72 and 1988-91).